A Brief Recap of Last Night’s Inaugural AIANY Oculus Book Talk Series with Carl Stein at New York City’s Center for Architecture as reported by Maxinne Rhea Leighton, Assoc. AIA: Carl Stein, FAIA’s Greening Modernism: Preservation, Sustainability and the Modern Movement (W.W. Norton & Company, 11.29.10) offers a compelling and insightful argument for a creative and enthusiastic reexamination of the interconnection between modern architecture, sustainability, historic preservation, and green strategies. One of the many things that sets this book apart from others on architecture and sustainability is the way in which Stein unfolds the theoretical, instructional, and pioneering tenets between design and technology from the pre-petroleum to late-petroleum eras, suggesting opportunities for architecture in a post-petroleum world. “A sustainable future,” writes Stein, “one in which humankind will have a place in the ecosystem of the Earth, depends on a fundamental reconsideration of how we utilize all of the resources that support the qualities of our lives.” The second greatest end-use energy consumer is infrastructure construction, and there is a dire need to upgrade this part of American society. As you read Greening Modernism, you, too, will be reminded that as much as the truth sounds good on paper, the hardest part is to convert these ideas to the politics of choice and economics. While architects have their challenges set out before them, Greening Modernism will be a hearty and generous companion for those who are willing to challenge what they value in themselves and consider to be the nexus of design, quality of life, and a sustainable global future. Note: This was the first of a monthly series of book talks hosted by the AIANY Oculus Committee. Maxinne Rhea Leighton, Assoc. 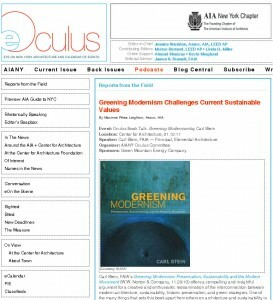 AIA, is a member of the AIANY Oculus Committee. She is a business development, public relations, and marketing professional in NYC and Washington, D.C. Her expanded project base includes cause-related marketing, and the integration of social media with traditional-based forms of communication for non-profit and cultural institutions.